Gold tequila is usually an un-aged tequila that gets it color from the addition of caramel before bottling. 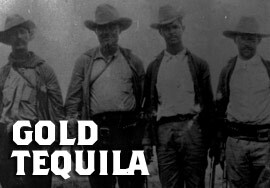 Gold tequilas often use a lesser amount of blue agave that make up some of the more premium tequilas. By using less blue agave, and adding caramel and sugar, producers are able to keep costs down and produce a more affordable bottle of tequila.